In the giant new lectionary, poster-child of the liturgical reform, we find very strange things if we take pains to scratch beneath the surface. 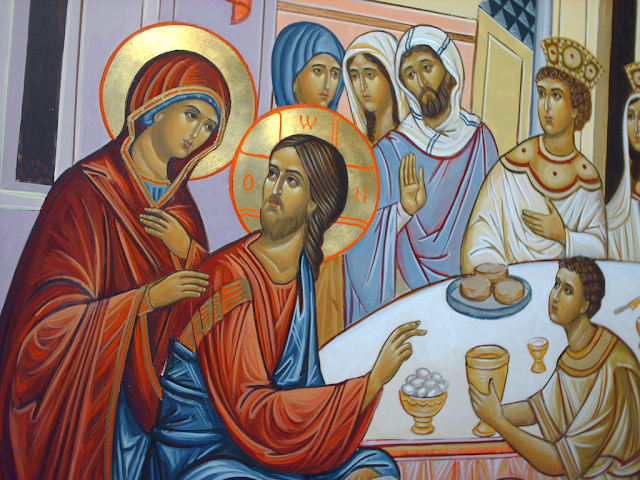 One of the most surprising, to me, was the discovery that the passage from the second chapter of the Gospel of St. John about the wedding feast at Cana—among the most picturesque, moving, and theologically profound passages in all the Gospels—is read only once every three years in the Novus Ordo (in “Year C”). In contrast, it is read every year in the old Mass, on the Second Sunday after Epiphany, where it has appeared for centuries without interruption. The wedding at Cana is the place where our Lord first reveals His glory; where His “hour,” the hour of His passion and cross, in a sense begins; where His disciples first believe in Him; where His Mother is shown as the perfect intercessor. It holds not only inexhaustible lessons for our spiritual life, as does any page of the Gospels, but archetypal ones that have no exact parallel elsewhere. It is, one might say, a “staple Gospel” or “super Gospel” that should never be too far away from our minds and hearts. Annually seems a natural rhythm. The old liturgy, as usual, acts on the right instinct. The new liturgy, in contrast, treats it as just another waystation in the drilled march through as much of Scripture as we can survive in two or three years. This Gospel passage is a perfect window into the larger problem of the murder of the Epiphany season. Those who attend the traditional Latin Mass are aware of how beautifully, how tenderly, how lovingly, the Church basks in the light of the newborn Christ, the youthful Christ, the Christ of the river Jordan and the miracle of Cana. Epiphanytide is one of the most poetic and touching of all the seasons (or “sub-seasons,” as it were). It starts with the feast of the Epiphany itself, which, in accord with unbroken custom stretching back for centuries, is celebrated on the “Twelfth Day” after Christmas, January 6 (and not on the nearest Sunday, to suit the world’s imperious work schedule). One week later, on the octave day, January 13, the Church in her usus antiquior celebrates the Baptism of Christ. Then the 2nd Sunday after Epiphany brings us the Gospel of the wedding feast at Cana. The three great theophanies or divine manifestations honored in this season—namely, the visit of the Magi, the baptism in the Jordan, and the wedding of Cana—are given their full individual due, without haste, without unseemly compression or alternation. Indeed, there is a leisurely feel to this Epiphany season, a sense of time suspended. It is as if Holy Mother Church, like a mother watching her children grow up too fast, cannot quite resign herself to parting from the young Christ. Epiphanytide is the afterglow of the revelation of Christ to the world, Christ who is the true Enlightenment against which the devil vainly (although at times with considerable temporary success) attempts to establish his substitutes—most especially the rationalist and liberal worldview under which Catholics have been living, and which they have slowly adopted, over the past several centuries, to the near extinction of their liturgical life. As Fulton Sheen famously said, “Every man was born to live; only Christ was born to die.” When the weeks after Epiphany have run their course, we arrive at Septuagesima, that wonderful door of transition to the three-week period of transition from the innocent joy of Christmas to the penance and introspection of the Lenten fast. What a masterful grasp of psychology the traditional liturgy displays! No normal human being would want to go from Christmas back to a so-called “Ordinary Time” and then be suddenly parachuted into Lent, as the Novus Ordo awkwardly does, with no attention to the exigencies of the heart. The ancient liturgy knows better: we must pass from a season that is, emotionally, perhaps the most contrary to that of Lent to the season of Lent itself by means of a medium or transitional period, a “post-Christmas and pre-Lent” period. This is Septuagesimatide. Let us return to the little town of Cana, the inauspicious place immortalized by the highly auspicious wonder wrought by the Word-made-flesh. Our Lord’s choice to be present at the wedding feast and to perform His first miracle there is traditionally seen as His blessing on the institution and state of marriage itself, foreshadowing His institution of the sacrament of matrimony and inaugurating His own nuptial union with His immaculate Bride, which culminated in the total gift of Himself upon the Cross. The way St. John deliberately connects Cana with Calvary is evident from a close study of chapters 2 and 19 of his Gospel. According to St. Thomas Aquinas, marriage derives its Christian greatness, its sacramentality, from the fact that it represents and, in a way, makes present the indissoluble union of Christ and the Church. Could anyone fail to see that this Gospel, perennially relevant at any point in history, is particularly central and urgent in our own times, when the Creator’s gift of marriage has been misunderstood, denigrated, attacked, redefined, subtly downgraded—sometimes, alas, even by members of the Catholic hierarchy? All the more reason, then, to hold fast to the traditional annual reading of the wedding feast at Cana, brought to you by your local traditional Latin Mass. May God in His mercy lead the Roman Church to rediscover, sooner rather than later, the immense divine and human wisdom that was and is enshrined in her ancient calendar, so that the faithful may measure their lives by its exquisite rhythm of feasts and seasons.